Offering an abundance of information and inspiration, Homemade is a revelatory addition to the craft world—the ultimate reference book on crafting and also a warm, engagingly written book that combines history and personal narrative with the science that makes a craft possible and the passion that inspires it. 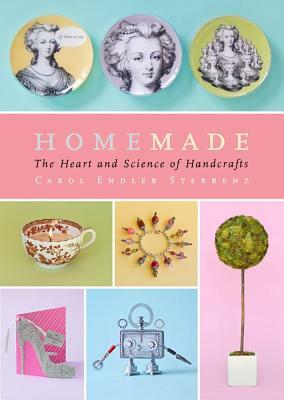 Carol Endler Sterbenz is a crafter, a teacher, a homemaker, a wife, and a mother. Raised by immigrant parents who taught her the enduring value of resourcefulness and creativity, she makes her lifetime of experience and infinite enthusiasm the foundation for Homemade. Sterbenz provides readers with not only practical information and direction but also a philosophy and methodology of crafting that build confidence and ability, making it easy to achieve truly professional results. Teeming with clear, reliable, and thorough information on everything from tools and materials to techniques, Homemade is an essential guide to seven of the most beloved crafts: beading, the flower arts, paper crafting, hand printing, decoupage, decorative embellishing, and children’s arts and crafts. Crafters—beginners and veterans alike—can turn to Homemade to learn which glues and finishes to use, how to form a perfect beaded loop, assemble a miniature robot, hollow out an egg, emboss paper, make a hand-tied bouquet, or transform a chandelier. Overflowing with hundreds of techniques; easy-to-follow step-by-step directions supported by more than eight hundred beautiful and precise hand-drawn illustrations, diagrams, and patterns; and countless insider secrets and troubleshooting tips, Homemade is an indispensable go-to reference no crafter should be without. Carol Endler Sterbenz is a well-known author, editor, and media personality. She has written more than twenty-five craft and decorating books including Pottery Barn Design Library: Storage and Display, American Country Folk Crafts, and the Instant Gratification series (Chronicle Books). A former syndicated columnist of By Hand and Primary Colors: Interiors, Ms. Sterbenz was the founding Editor-in-Chief of the quarterly magazine Handcraft Illustrated. She lives with her husband, John, in Westchester County in NY.